Laredo, TX - Accident News and Resources including car, bicycle, motorcycle and truck accidents and much more. Laredo is located on the north bank of the Rio Grande in South Texas, across from Nuevo Laredo, Tamaulipas, Mexico. The city's economy is based on international trade with Mexico, and many major transportation companies have facilities in Laredo. Laredo is the largest inland port on the United States-Mexican Border, and boasts four international bridges. Many major roadways begin and end in Laredo because of its position on the International border. Here are details about a few on the American side. Interstate 35 is a north-south highway that begins in Laredo and stretches all the way to Duluth, Minnesota. U.S. Route 59 is a north-south border to border route, stretching from Laredo to the Canadian border north of Lancaster, Minnesota. U.S. Route 83 begins runs from Westhope, North Dakota to Brownsville, Texas, running in between the Canadian and Mexican borders and passing through Laredo on the way. Texas State Highway Loop 20, also known as the Bob Bullock Loop and Cuatro Vientos Road, loops around the north and east sides of the city of Laredo, connecting with the World Trade International Bridge. Laredo is served by the Laredo International Airport, which has three commercial airlines running flights to Houston, Dallas-Fort Worth, Las Vegas, and Orlando. Public transit in the city is managed by El Metro Transit, which operates 21 fixed route bus lines in the area. 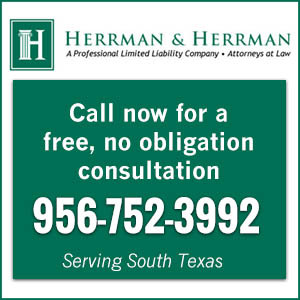 When someone has been injured or killed in a motor-vehicle collision in Laredo, the accident victim and their family members are left with medical bills, lost income, and other costs. It is important to get legal assistance to help the accident victim recover, or when the accident is fatal, to help the family members begin to recover from their losses. 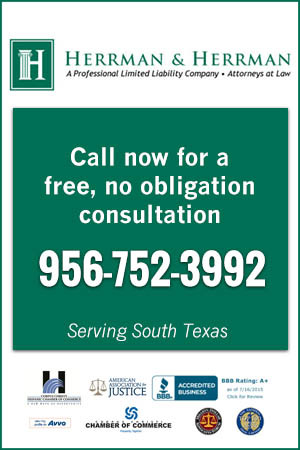 Learn more about how a Laredo personal injury attorney will help injured victims and families. How Long Until My Case is Settled? Settlement? Why Aren’t We Going to Trial? It is Possible to be Injured in a Minor Car Collision? While these lower severity cases may not be appealing for a television audience, and they may not be glamorous cases, injuries definitely occur with glaring regularity in lower impact collisions. Herrman & Herrman Fiesta Texas Summer Giveaway! The Herrman and Herrman Summer Giveaway will only be available for entry through the giveaway blog submission form. No entries will be accepted by phone, mail, Facebook, or direct e-mails. This specific ordinance lays out the how motorist are supposed to interact with non-motorist on roadways within the city. As the weather begins to warm and the summer approaches one of the real dangers of the summer has come upon us. People mistakenly leaving their loved ones, whether human or furry, unattended in hot cars. The Herrman and Herrman Father’s Day Giveaway will only be available for entry through the giveaway blog submission form. What Does The Pre-Litigation Process Look Like? After an accident and before it is necessary to file a lawsuit quite a bit happens. During the pre-litigation stage, your attorney has several goals. You may not believe that a subtle physical condition is related to the collision, but it is best to discuss these issues with your doctor because it may be related. The amount of driving done by Americans has been rising with each passing decade, making it more important than ever that Americans learn to properly maintain their tires. Most commonly, these people refuse to have their vehicles sent for repairs simply because they underestimate the danger of the defects in their vehicles.